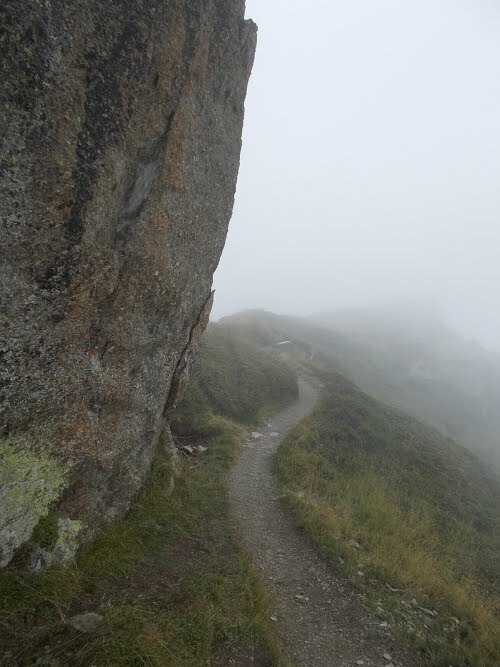 Another Long Walk: Day 8: NO PICNICS! September 2: It continued to sprinkle and on and off during the night, but by morning the rain had stopped. 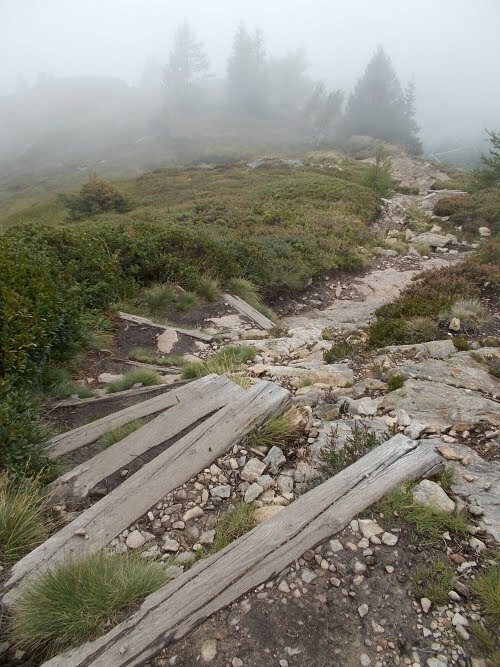 The trails could hardly be called dry, however. 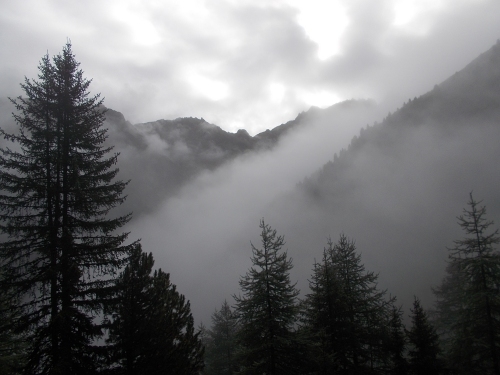 The fog was thick, giving everything a slight dampness and tree snot continued to rain down in the thick forests. 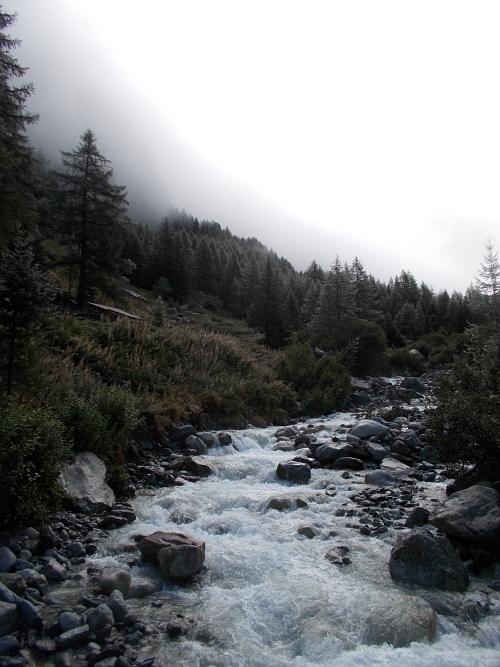 So I lingered in camp, in no particular rush to get out into the weather. 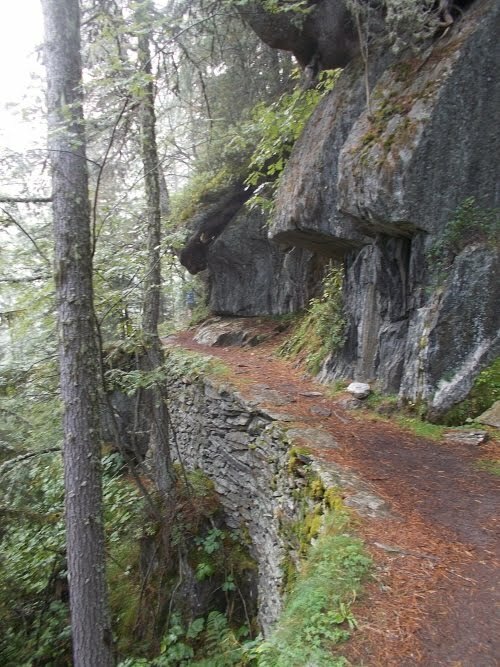 In any case, I was well ahead of my self-imposed schedule for finishing this trail. No reason to rush out of my comfortable, warm sleeping bag! Claude left camp at the same time I did. So I slept until 8:00, and didn't get up and hiking until closer to 9:00. Claude, my French friend from the evening before, seemed to be on the same schedule since we left at the same time. 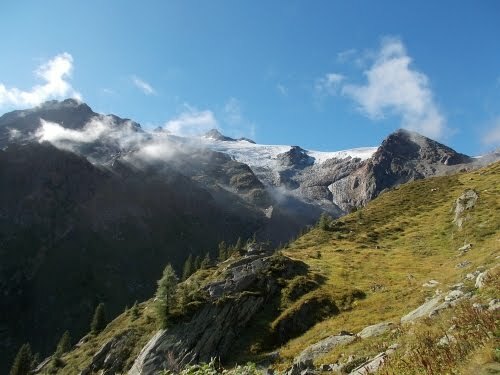 Once again, I had two choices of routes to follow, and once again I chose the higher, more strenuous and--on a clear day--the more spectacular of the two routes. The trail immediately climbed a steep but well-graded trail up towards the Refuge Les Grands. 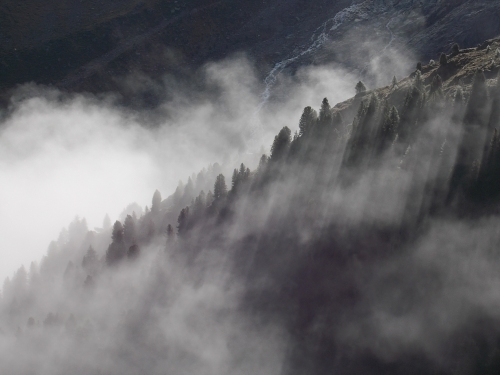 The fogged thinned the higher up the mountain I climbed, which I attributed more to time passing than elevation gain since I could see all of the way back to the bottom of the valley between twirling wisps of fog. 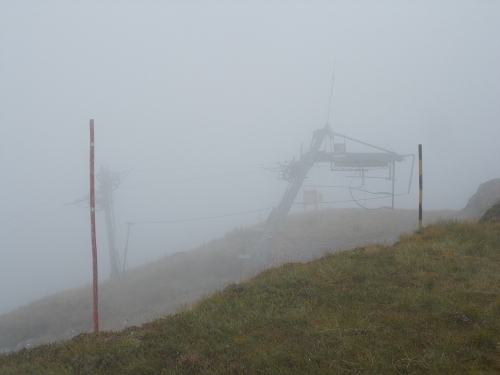 The fog was definitely getting thinner because I had not been able to see this high up the mountains when I was at the bottom. I stopped for a quick snack outside of the refuge, admiring the commanding views of Glacier des Grands--another gorgeous glacier just up the slope. I had seen hints of swirling through the fog, but for about 15 minutes, the sun broke through and I got clear, unobstructed, jaw-dropping views of it. 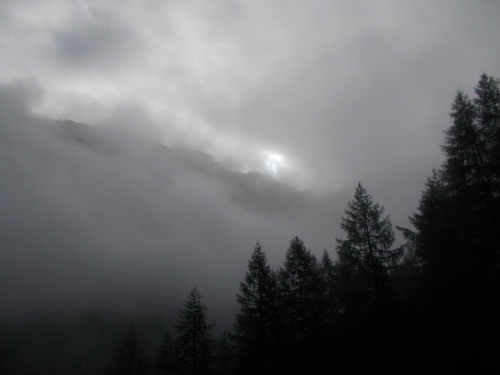 Then the misty fog returned and toyed me with me, hiding and obscuring the incredible views. 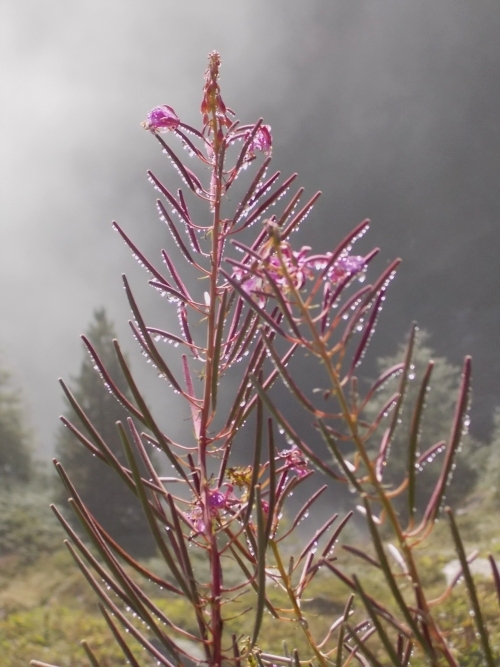 I waited with my camera ready for the briefest of breaks in the fog. A snapshot of a window into a view surrounded with fog. 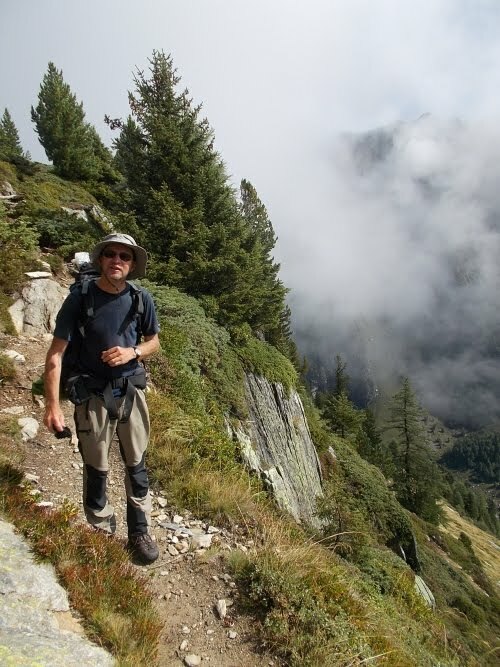 From the refuge, the trail climbed a bit higher then leveled out over some rugged rocks. The trail wasn't difficult, but it wasn't fast either. The twirling mists of fog continued to toy with me, obscuring views but occasionally giving me small peeps of the surrounding grandeur. Annoyingly small peeps. Go away fog!!!! 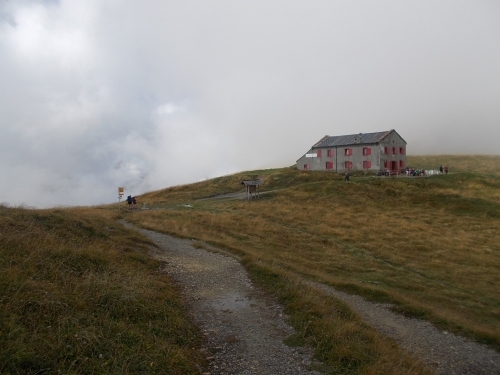 The refuge enjoys a privileged position on the broad grassy saddle of the Col de Blame. 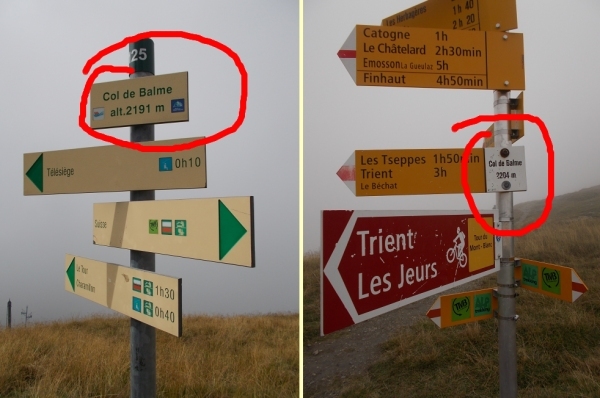 At the col itself, two signs give conflicting altitudes: one says 2191m, the other 2204m. There has been a hostelry of some kind here for well over a century, a bone of contention between the two countries, as a result of which it has been burnt down and rebuilt several times. 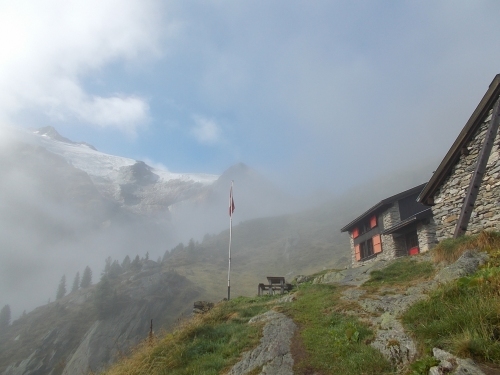 Purchases can be made at the refuge in either Swiss francs or Euros, while the views are magical. The views today were nice, but the fog undoubtedly took away some of the magic. I looked for the two disagreeing signs and sure enough, there they were. One measured by France and the other Switzerland. You'd think in this day and age, they'd finally agree on one altitude for the location. Satellites and GPS forever clarifying the discrepancy, but I guess not. I wondered if the real altitude was somewhere between the two posted altitude making both signs incorrect. And if the closest they could come to agreement on an altitude is 13 meters (about 43 feet), how accurate are all of the altitudes listed on this route? Are altitudes really what they state... plus or minus 15 feet? 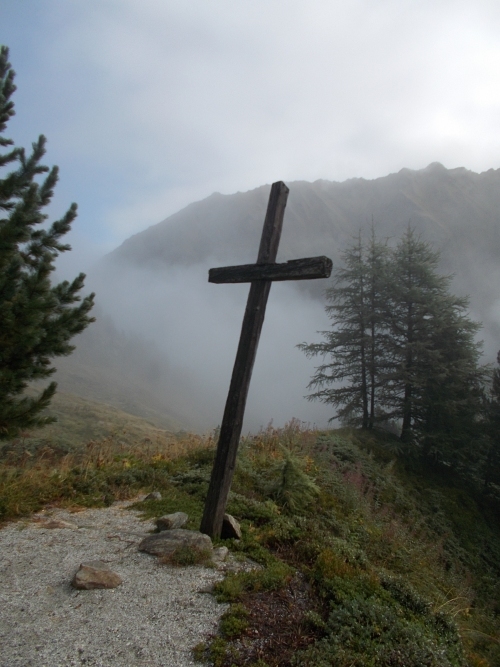 I sat down at a table at the refugio and chatted with a couple of hikers. Claude was hoping to catch up with a woman he'd met earlier on the trail, an American, who he expected to be here around lunchtime and I looked around at the assembled hikers seeing if I could pick her out. Which I did. =) Claude would catch up about a half hour later. 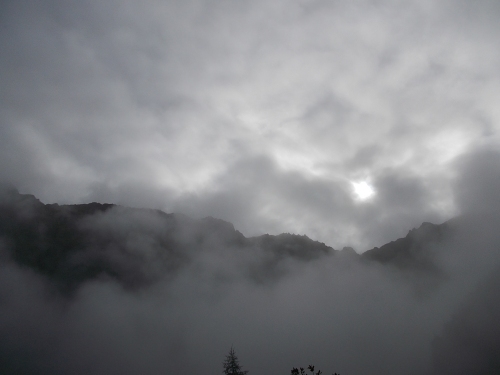 At the pass, the temperatures were cold and windy and I thought about quitting for the day. I was already ahead of schedule, and the last weather forecast I'd seen predicted better weather tomorrow. I'd rather trade a short day of bad weather for a long day of good weather. I could stay at the refuge, protected from the wind (albeit still cold, but warmer than outside temperatures). Hopefully wake up to a bright, sunny morning and see the views of the area in unobstructed glory! The idea really appealed to me, except that it was so darned early in the day. I was afraid I'd go crazy from boredom stopping so early in the day. Then a woman came out of the refuge, seemingly upset at me, but I had no idea why since she only babbled in French. "Do you speak English?" I asked. "Blah blah blah blah!" Finally, one of the other people nearby who spoke both English and French translated for me, saying that she wanted me to leave because I hadn't bought any food and "picnicing" was not allowed there. Seriously? WTF? I wasn't even eating anything--which was my idea of a "picnic." But even so, so what? It's not like the place was crowded and there weren't enough chairs to go around for everyone. I'd be a little more understanding if the place was packed and so preference was giving to paying customers, but I saw little reason to kick me out. And hell, I'd actually been thinking about spending the night--which, if I did, would have probably including my purchasing a meal for dinner. Screw you, I thought. I'll go somewhere else and the 30+ euros I might have spent here will just stay right in my pocket. I walked around to the side of the building--out of view, but still where the building would break the strong winds. I ate a quick snack and left. The trail up was steep, but very well graded! 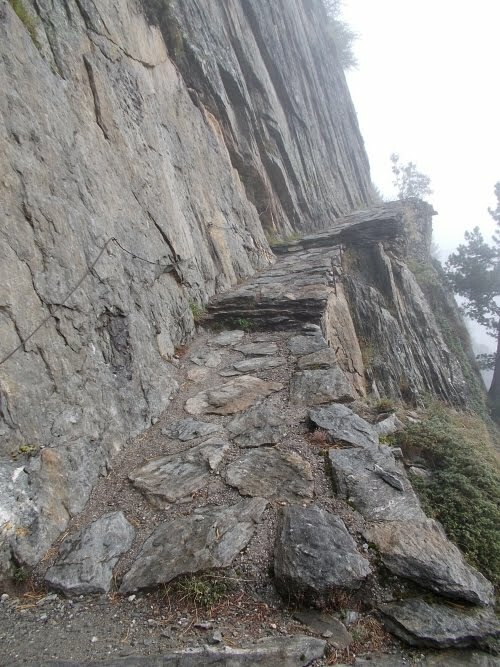 I followed the trail downhill and back into France. 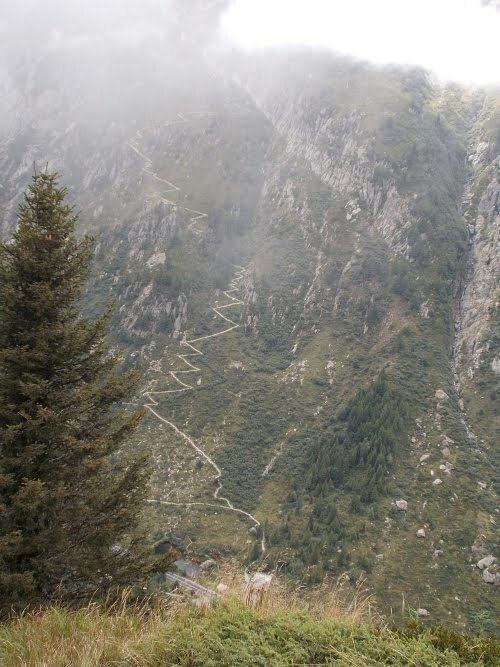 The trail once again became wide and easy to walk, but many of the intersections were unlabeled which often left me looking at my guidebook and scratching my head trying to figure out which way to go. My guidebook, for all of the details it provides, has absolutely terrible maps. As if they were drawn by Picasso. 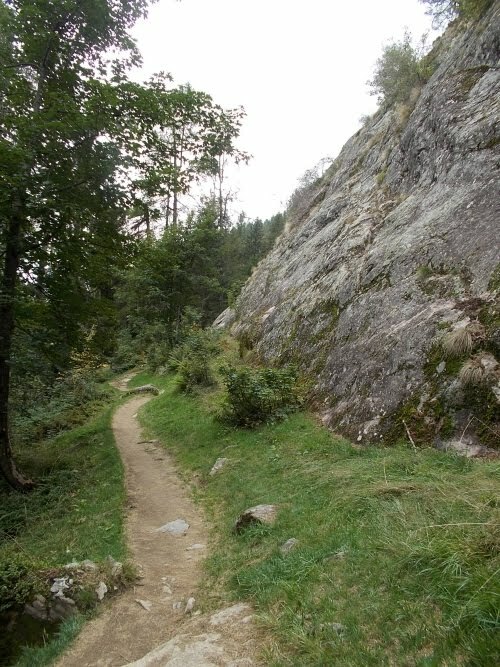 They are terrible for navigating, and fortunately, for most of the trail, completely unnecessary. I took a few educated guesses, though, and after five or ten minutes, I'd reach a sign that confirmed I was still heading in the correct direction. But did I really have to go into town? My main issue was food. I had intended to resupply here, but I always liked to carry a bit of extra food just in case it takes me longer to reach my destination than I expected. So it's not like I was out of food--but I also hadn't counted on two extra days of hiking between resupply points either. I decided to skip town, but I'd have to ration the food I had left. 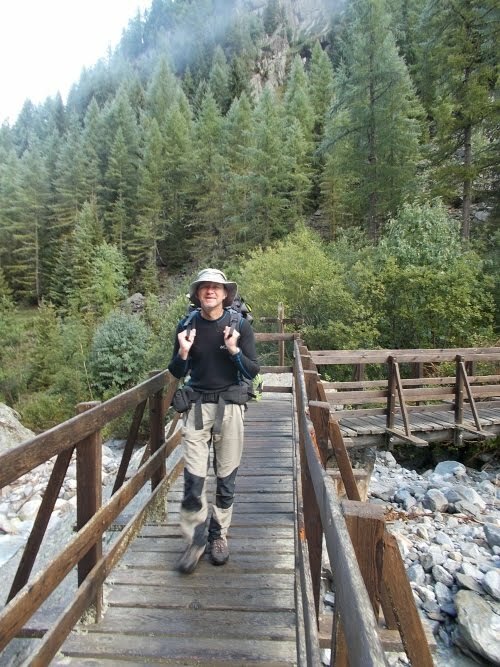 And maybe pick up a meal or two at one of the refuges along the route to supplement it. I wasn't going to starve to death--that's for sure! With that thought in mind, I crossed the road and headed back into the woods. 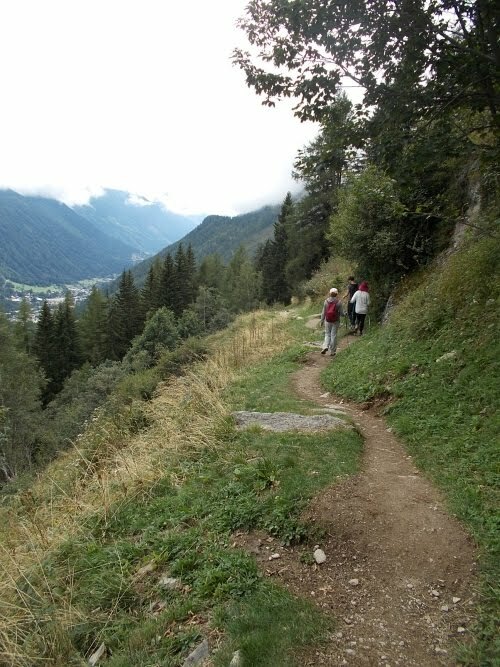 The Tour Mont Blanc is one trail, but it almost seemed like there were two parallel trails next to each other because for most of the route, there's always an alternative option available. The alternative is usually shorter, or easier, and stays lower down the elevation (but not always). In this case, I stayed on the main trail and avoided the alternate. The main trail heads up a series of steep ladders which looked like a lot of fun while the alternate route climbed a series of steep (but well-graded) switchbacks that looked boring by comparison. Almost every other time, I stayed on the alternates, but not this time! I didn't go much further on the trail. Not only was I well ahead of my schedule, but I had already passed my goal for the day too. I stopped at the first good place I found to camp and, being in France, no longer had to camp illegally. 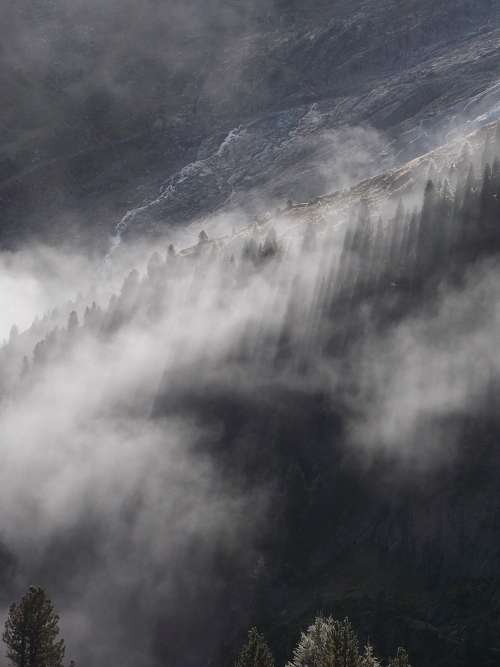 I set up camp at the edge of a small meadow under a steep rock face. It was protected down here, away from the strong winds. And fairly low in elevation, a bit warmer than the mountain tops and ridges. It didn't look like it would rain so I didn't even bother to set up my tarp either. Late in the evening, just before I was about to go to sleep, it started to sprinkle. Curse you, weather gods! I shook my fist at the heavens. I didn't think the sprinkles would last and considered just wrapping myself up in my tarp like a burrito--it was a last faster and easier than setting it up--but eventually decided on half a set up only setting up the end by my head. The end by my feet I let lay on the ground and myself. And then I went to sleep. 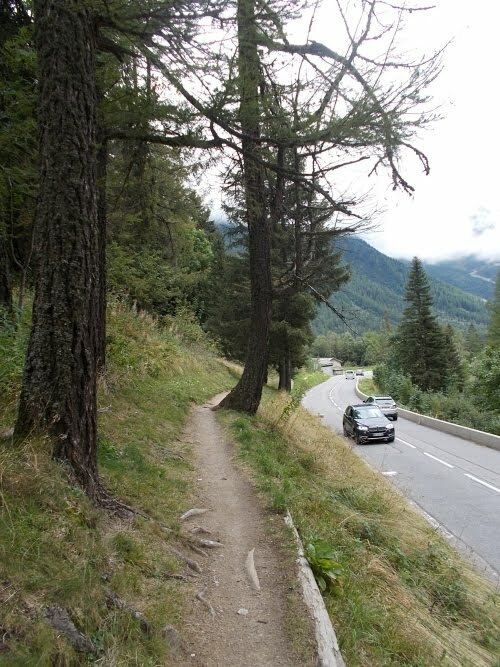 If you're worried about the steep drop on the right, not to worry! There's a cable you can hold onto on the left! 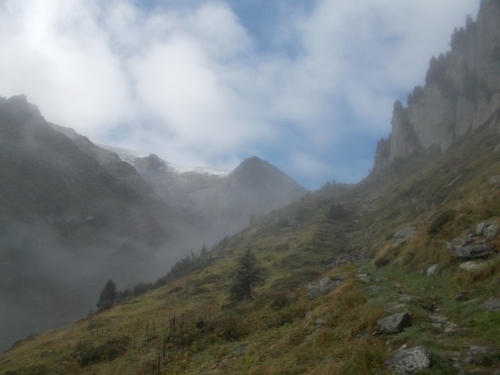 Refuge Les Grands, with the Glacier des Grands behind it barely speaking through the fog and mists. I will say--one of the coolest fog effects is when the trees cast long shadows into the fog! For a brief 15 minutes or so, the fog and clouds almost completely vanished--and it was awesome! Claude caught up with me briefly near the refuge, but then I'd pull ahead again until he'd catch up again at the next refuge. An alternate route for the trail goes through the tail down there (I think), but I'd just see it from this bird's-eye view. 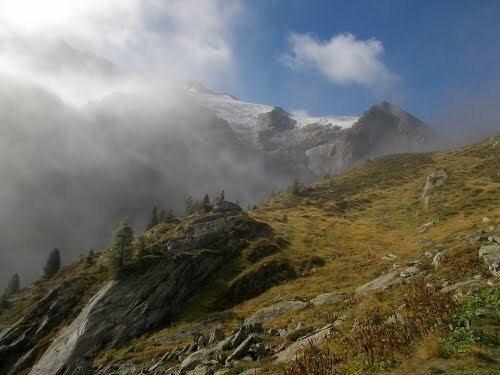 The Col de Balme has a refuge directly on the Swiss-French border. 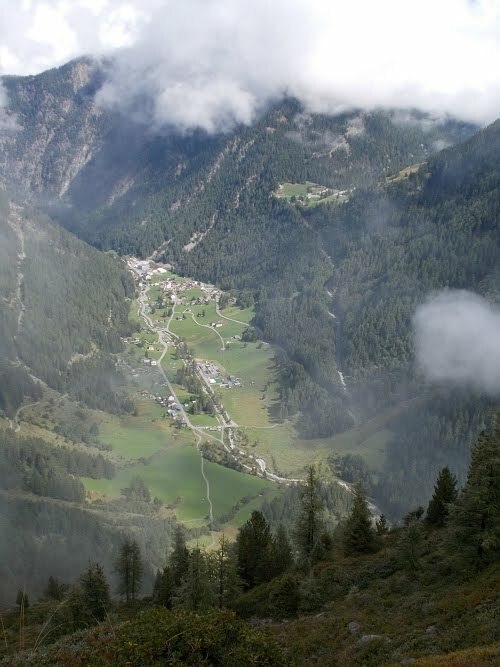 But there's no agreement between the Swiss and French about the altitude of this pass! 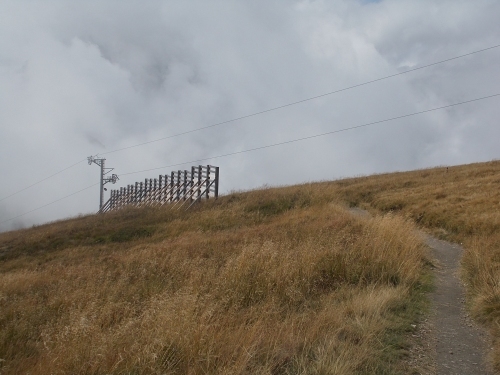 On the left sign, it says we're 2191 meters above sea level, while on the right, it says we're 2204 meters above sea level. 'Twas a steep descent towards Tre-le-Champ! The road at Tre-le-Champ, which from here is a 40 minute walk into town. But I was stunned when I opened the door. Best outhouse EVER!!!! 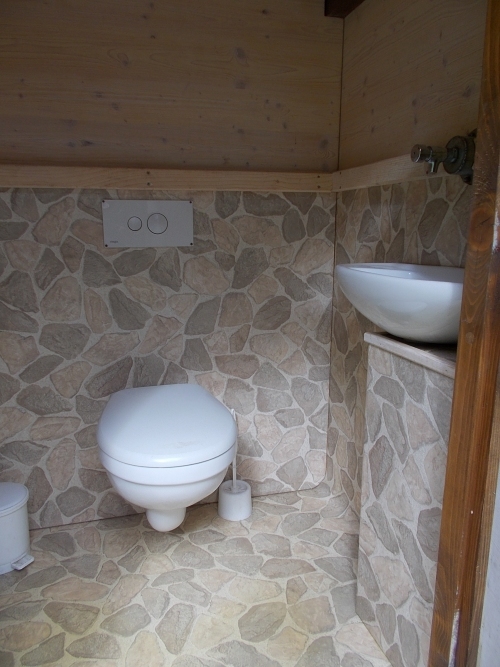 =) Laminated floors and walls, a sink, and a flushing toilet! Time to find a place to camp.... I wound up setting up camp at the edge of a meadow a short way up the trail from here. 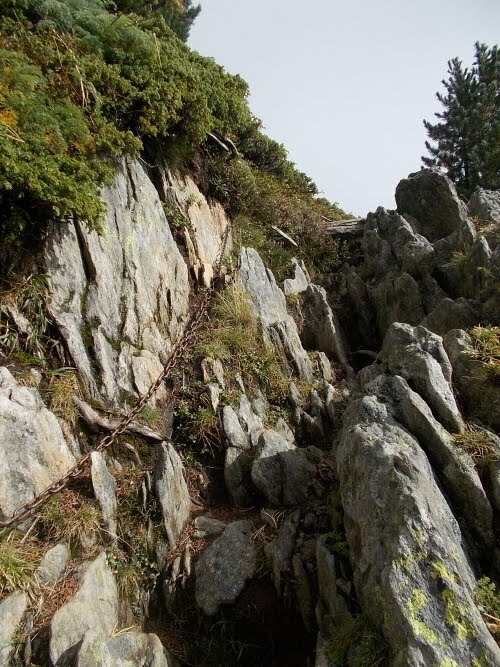 That zig-zag trail looks so scary! 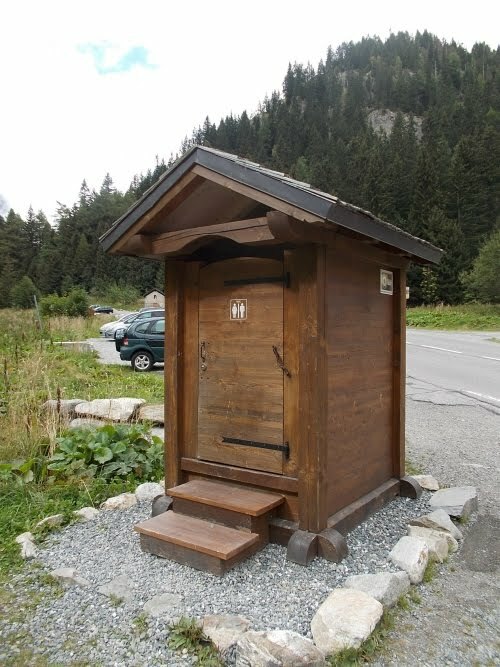 I love that outhouse! So fancy! Day 1: The Start of the GR 20! Day 9: Ladders! Ladders! And more ladders!